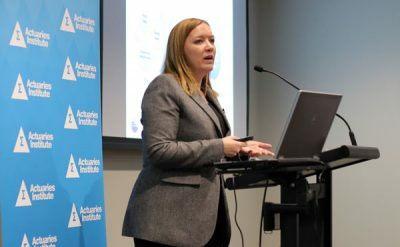 An Actuaries Institute event last week explored case studies of the physical risks from natural disasters, transition risks for investors as economies adapt to low carbon emissions, and governance risks for trustees and boards of directors. Around 60 delegates gathered at the Institute’s Forum last Thursday (29 September) for the Climate Change Risks Insights Session. Attendees represented a wide range of industries. While members practicing in general insurance made up the largest group, over half the delegates were from other practice areas including life and health insurance, reinsurance and banking. The event heard from three speakers: Tim Andrews, Actuary and Director of Finity Consulting, Emma Herd, CEO at the Investor Group on Climate Change (IGCC), and Special Counsel at Minter Ellison Sarah Barker. The speakers each addressed one of the primary channels identified by the Bank of England in their analytical framework for assessing the impact of climate change. This framework separates financial risks of climate change into physical risks, transition risks and liability risks, and has proved to be a useful assessment tool. Of the various physical risks presented by climate change, Tim Andrews (pictured below) focused on changes in weather risk, considering thunderstorms, low-pressure fronts, and cyclonic conditions. The discussion was timely, coming in the midst of the storm sweeping through South Australia, wiping out power across the state. While it was considered to be “a one in 50-year event”, it does follow a year of higher than average storm frequency and severity. Tim explored some of the influences on the formation and size of storms. Overall it is expected that there will be fewer weather events across Australia, but those that occur will be more intense. Higher sea levels are also important risk factors when coupled with storms. Cycles still drive much of the experience (seasonal, ENSO, Indian Ocean dipole) which, along with natural variability, makes a climate change signal harder to see and data insights limited at this stage. One somewhat surprising fact for many in the room was that Melbourne has more high wind days than Cairns! Emma Herd then discussed transition risks. She explained that the Paris agreement, which (at October 2016) has been signed by 191 UNFCCC members and ratified by 62, is significant because it has sent a market signal, and is more practical than previous attempts to achieve international agreement. The presentation then outlined the path required to meet climate change obligations given different starting dates. Natalie Warren, Head Business Actuary at XL Catlin, who was in the audience, explained that too rapid a transition to a low carbon future is still seen as a threat to financial stability instead of a positive outcome. “No matter when action is taken to reach a net zero emissions future by 2050, the transition curve is extremely steep – and we have already started too late,” she said. Australia with its dominant resource and finance industries will be particularly exposed to the transition as well as the physical effects of climate change. Regardless of this, actuaries should consider whether the models they build are sufficiently allowing for climate change risk, now and in the future. 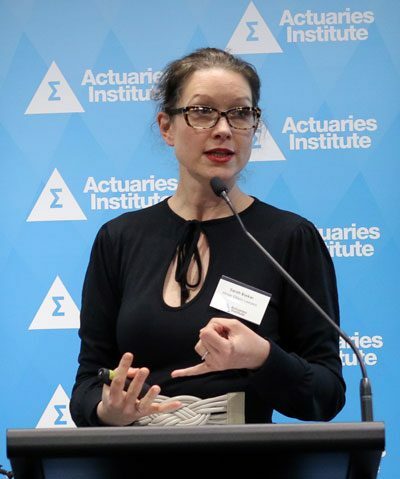 “Because climate change is a financial risk, and measurement and management of risk is actuaries’ expertise, there is a role for us to play in raising awareness and making these changes happen,” said audience member Stephanie Wong, an actuary at Suncorp. Emma Herd (pictured left) explained that there are investment opportunities in transition to a low carbon future. International action is already being taken by France and green finance regulation in China means a booming industry of green bonds and renewable energy lending. Back in Australia, super funds are also exposed to transition risks with significant investments in those same two sectors with the largest exposure to climate change risks – mining / resources and financial services. Australia’s banks carry huge climate change risk on their balance sheets through fossil fuel project lending and mortgages on properties exposed to the physical risks of climate change. Sarah Barker (pictured right) explained that there are a number of areas of law in which climate actions can take place. So far, there have been no successful class actions against a company for negligence, or for misleading and/or deceptive conduct. Actions are progressing however; the Illinois Farmers Insurance vs Chicago action, in particular, tested the water. Misleading disclosures are another notable area of risk for companies. This is particularly the case where asset valuations change dramatically due to the inclusion of climate change whether it be the physical effect, or a likely outcome of climate change adaption. General caveats in asset valuation disclaimers will not be enough to protect companies – the risks will need to be specifically caveated to avoid potential legal action. In terms of insurer disclosure, The California Insurance Commission was mentioned as leading the way as it already requires insurers to disclose how they are managing climate risks – both physical and financial. “Sarah’s talk made clear that, as a director, it is no defence to be ignorant of climate change risks, to be a climate denier, to default to the inadequate peer group response or to do nothing,” said Natalie. 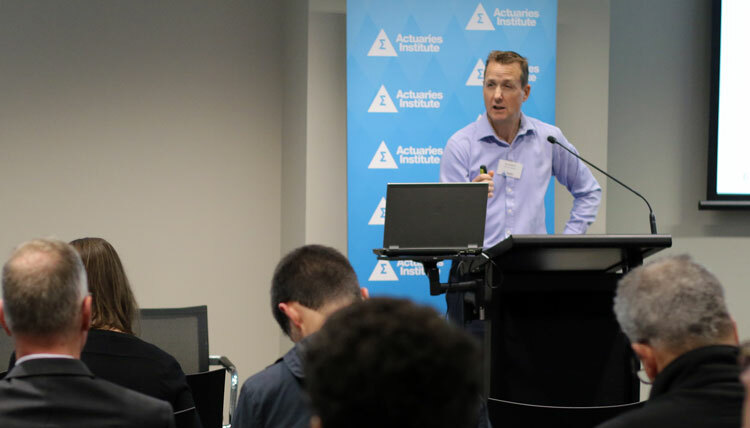 Overall, the day provided delegates with broad insight into current physical, transition and liability aspects of climate risk, and illustrated that climate change and related adaption will impact on all areas of actuarial focus. The speakers’ Presentation Slides can be accessed here. An upcoming paper by the Institute’s CCWG on “Climate Risk Management for Financial Institutions” goes into more detail about how these kinds of considerations are relevant for financial institutions like banks, insurance companies and superannuation funds. This paper will be presented at the upcoming GI Seminar. David Jenkins has twenty years’ experience in the Australian general insurance industry. David is currently Manager of General Insurance Actuarial Services at the Australian Prudential Regulation Authority, where he supports the prudential supervision of general insurers as well as providing internal actuarial advice. Before his role at APRA, David worked at Insurance Australia Group and the Australian Bureau of Statistics. For several years he was also Treasurer of his children’s community preschool, giving him an insight into issues faced by small business. David is a Fellow of the Institute of Actuaries of Australia. Stephanie is the Digital Marketing Manager at the Actuaries Institute and regularly writes and produces video, audio and imagery for the magazine. She has a background in journalism and is involved with the Institute’s public policy and media work.